As a self-employed consultant I need to document my work and travel rather closely. All my appointments and engagements are recorded and synchronized with my PC daily, just drop it into a cradle and push one button. The data feeds into my QuickBooks billing & accounting software via an export file. It works better than any other scheme I've tried, and I've tried a lot. To Do Lists -- one list per client, calls to make, HOT! items, etc. Numerous web pages designed for PalmPilot off-line reading using AvantGo including the New York Times, the Wall Street Journal, InfoWorld, Letterman's Top Ten, I, Cringely and lots more. There is a desktop application that configures subscriptions and HotSync's the data to the Palm. Amazing product, highly recommended. KarKare -- tracks miles-per-gallon and reminds me of oil changes etc. JShopper by Land-J Technologies -- shopping lists for 15 stores, really slick. Fixes the part of my brain that forgets stuff until at the checkout with five people behind me. Puma Technology has software that can HotSync the data from lots of products directly into the Palm, take a look. One of the best Pilot sites I've found. I almost always find what I need here. Probably the busiest of the handheld computing newsgroups. Fascinating reading, good reviews, archive of past issues. Available in print also. Source for some unique items such as auto seat desks, and laptop steering wheel clips. Home of TimeReporter & ExpenseReporter software. 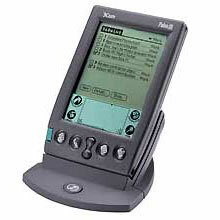 PDA Direct, Inc. - Your One Stop PDA Shop! Questions or problems regarding this web site should be directed to info@truslow.com. Copyright © 1998 Network Consulting & Support. All rights reserved. Last modified: Saturday January 16, 1999.